Power struggles within the Legislature and an increasing redistricting role for the federal courts formed a backdrop for many contentious moments during the 1960s. 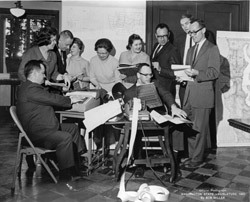 The League of Women Voters again played the role of catalyst as its members gathered enough signatures to place a new redistricting initiative on the ballot in 1962. This time the measure failed at the polls, but the Legislature was soon forced to reassess its redistricting efforts because of a legal challenge. James Thigpen, a Justice of the Peace, argued that his right to "equal protection" was violated by the huge imbalances in the size of the state's legislative districts. The federal district court judges who heard the case of Thigpen v. Meyers in 1962 sided with Thigpen, finding that the districts drawn in 1957 were discriminatory. The Court did not immediately provide a remedy, however, but gave the Legislature an opportunity to address the situation during the 1963 session. Deep party divisions made consensus difficult. The two redistricting leaders, Republican Slade Gorton in the House and Senate Democrat Bob Greive, both followed a strategy of divide and conquer, trying to draw support for their plans from members of the other party. Despite the threat of court action, the session ended with no compromise. When the Legislature met in 1965, the justices had intervened and ordered legislators to finish redistricting before passing any other bills. A new Republican governor, Dan Evans, changed the dynamic and played an active role in the redistricting battles. Tensions were high and fatigue set in. A compromise bill finally passed and was signed by Governor Evans on February 26, 1965. The legislators had fulfilled their mandate and redistricted themselves, but not without a legacy of bitterness.